‘Love in the Moonlight, Together for All’ 2018《中秋情，献温馨》之夜, is a fundraising event by Shan You. 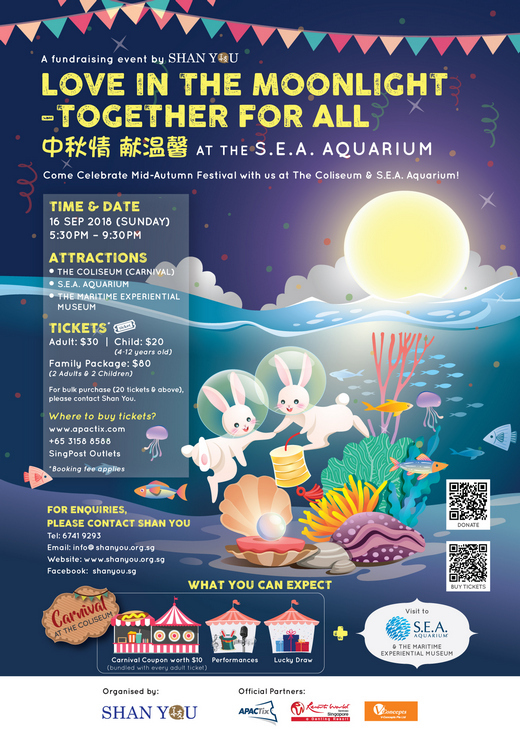 In its 2nd year, the event brings the community together to celebrate one of the important festive in our cultural heritage – the Mid-Autumn Festival. It also allows Shan You’s beneficiaries to feel the love and joy during such festivity. This event is also held in conjunction with the International Day of Older Persons to celebrate and recognise the contributions of our elderly to society. The society aims to raise $200,000 through this event so that it is able to further its work on advocating good mental health as well as providing social care. Including any other duties as assigned by the Working Committee.